You can securely book your rental online through this site by searching the rentals and using the Book It Now Option. Once your request is processed, you will receive an email confirmation with your reservation number. The $500 security deposit is required at the time you place your reservation request. The rental balance is due 60 days prior to your arrival. For stays of a month or longer, 25% of the balance is due 120 days prior to your arrival and the rental balance is due 60 days prior to your arrival. The security deposit holds your reservation until the rental balance is processed. Should you cancel your reservation before the rental balance is due, the deposit will not be refunded. Once the rental balance is processed, the security deposit then converts to a damage deposit. It will be refunded in full within 10 days of your departure provided that there are no violations of house rules or association rules during your stay; also there should be no instances of damage, theft, excessive cleaning or violations upon your departure. Two weeks prior to your arrival we will email you check in information which will include your access information to the resort and the vacation rental. Should the resort you select require access cards or parking passes, we will deliver them to your rental for your convenience. No formal check in is required, you are welcome to head straight to your vacation rental on your arrival date at 4:00pm. Check in is 4:00pm and check out time is 11am. What can I expect to find in my Vacation Rental? Our vacation rentals include linen, beach towels, hair dryers, washer, dryer, dishwasher and full stock of kitchenware. You will notice a variety of non-perishable items such as condiments and spices are left in the kitchen for guests. We also provide a starter set of paper towels, toilet paper, facial tissue, trash bags, laundry detergent, dishwasher detergent, dish soap, sponge, shampoo, conditioner, lotion, soap and a complimentary bag of coffee. Will I have wireless internet service and local phone service? Wireless internet and local phone calling service is available at no extra cost in all of our vacation rentals. Is additional cleaning service available? The vacation rental will be cleaned upon your arrival and cleaned upon your departure. We are happy to provide additional cleaning services for a fee and will need advance notice for scheduling purposes. 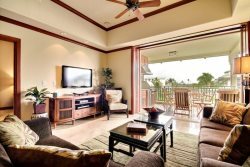 All of our vacation rentals are non-smoking which includes the lanais. As much as we too love animals, we unfortunately do not allow pets in our vacation rentals.